Contact lists and address books that contain duplicate entries and out of date information can be a hindrance that slows down the work process and prevents important messages from getting to their intended recipients. For professionals who don’t have the time to spend manually updating their contact lists on a regular basis, Scrubly is a web-app that can make the process automatic. Scrubly works with Outlook, Mac, Gmail, and Google Apps, so you’ll need to have an address book with at least one of these services in order for the application to work. The clean-up process itself can be done in five steps. First, you have to sign up for a Scrubly account by creating a username, entering your email address, and choosing a password. Next, you’ll need to create a profile by clicking on the type of contact list you want to clean up. 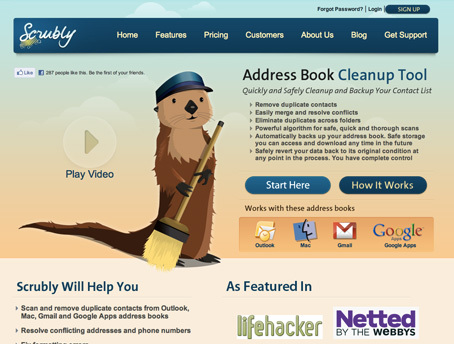 If your address book was created with Outlook or Mac, then you’ll need to install the Scrubly client on your desktop. If not, you can move on to step four, which is letting Scrubly do its thing. The web-app will automatically process your clients while still letting you decide whether to auto merge contacts or manage duplicates on an individual basis. Step five is to sit back and enjoy your newly scrubbed contact list. Scrubly will let you know exactly how many duplicates were found and discarded, so you know for sure that the app was actually working. In addition to merging contacts, getting rid of duplicates, and deleting junk email addresses, Scrubly uses an automated data backup system to archive each original data file. These original files can be downloaded and restored in the event that Scrubly scrubs out a little too much, or if your contact list ever turns up missing or broken.